Home » Beauty • Know How » Say YES to the Sun! How I Care for My Skin, Hair & Nails in Summer? When I go on holidays, I ask myself one question: should I protect skin from the sun or let it get tanned? The answer is always the same. Protect so it gets at least little suntan. In the post, I’ll present my methods for safe sunbathes and keeping summer tan the longest possible. Similarly to shoulders, the face gets tanned very quickly and is the most exposed to burns and irritation. That’s why I use sunscreen before every longer walk, bike ride or lying on the beach. I apply moisturising masks every evening and do an exfoliating scrub once a week. Enzymatic scrubs clog my skin pores so I prefer fine-grain ones. When I choose a moisturising product, I check if it contains Vitamin E, Coenzyme Q10 and other ingredients that fight free radicals and firm the skin up. In my bag, I always have a small moisturiser for face and hands. I care for my body in a similar way. 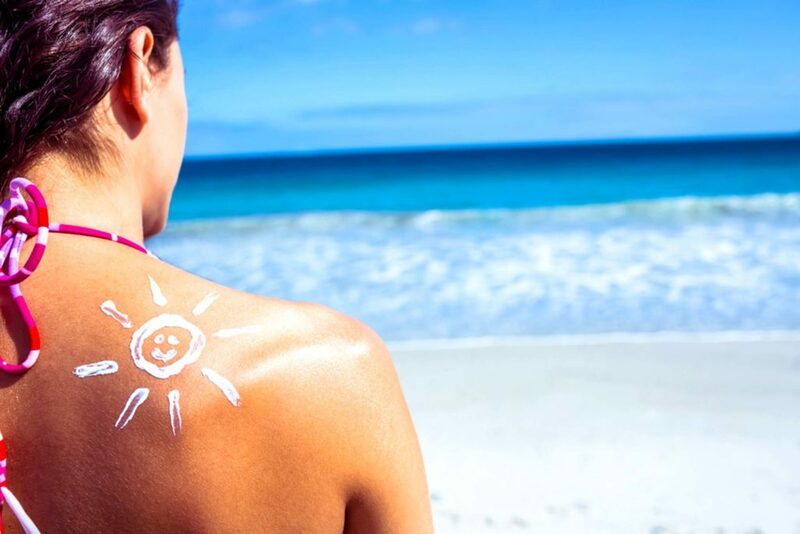 Oils with sunscreen, moisturising lotions and cosmetics that illuminate and make the tan last. I do a scrub once a week and apply a hydrating or soothing lotion, oils or butters. I go for products that include vitamins and anti-aging substances. They need vacation as well. When I go on a trip, I give up on hybrids and colored nail polish. Neutral shades or vitamin conditioners are perfectly enough. I pick the ones enriched with vitamins A, C and F, calcium, amino acids and keratin. Every few days, I soak my nails in apple vinegar or rub them with a lemon peel. Such treatments are great at brightening discolorations, eliminating white spots and softening cuticles. Similarly to skin, hair is largely exposed to the sunlight. Due to the UV radiation, hair is dry, dull, brittle and prone to thinning. All we need to do is protect it with SPF-enriched mist or oil. In summer, I put on a hat that shields my hair, face and shoulders. I apply a smoothing serum to hair ends. How to care for hairdo after vacation? You can do a repairing or moisturising treatment, use masks or conditioners with keratin and vitamins.